I never realized when I ordered All in a Garden Fair by Alice T. A. Quackenbush (A. T. De Le Mare Company, Inc., 1925) that I would discover important information on the relationships between some flowers and garden fairies. I had no idea that learning of that relationship would forever change how I think of that peskiest of weeds, the dandelion. Often the first blooms of spring, blooming right after the snowdrops and crocuses, the dandelions taunt me early in the season in both lawn and flower border. They persist and bloom right up until the hard freeze of fall. Their roots are never-ending and they find the most impossible places to grow, just out of reach of the dandelion digger. I feel certain I will never get rid of them. And though I know that all good gardeners fight dandelions, I feel a bit of shame for all the dandelions I let grow in my garden. I try to get rid of them, as most gardeners do. They are impossible to dig out completely so I often resort to just cutting off the blooms or more often the seed heads, hoping to outlast the dandelions. Honestly, it is laughable that I optimistically expect that if I keep cutting back the blooms, the dandelions will one day just give up and die. 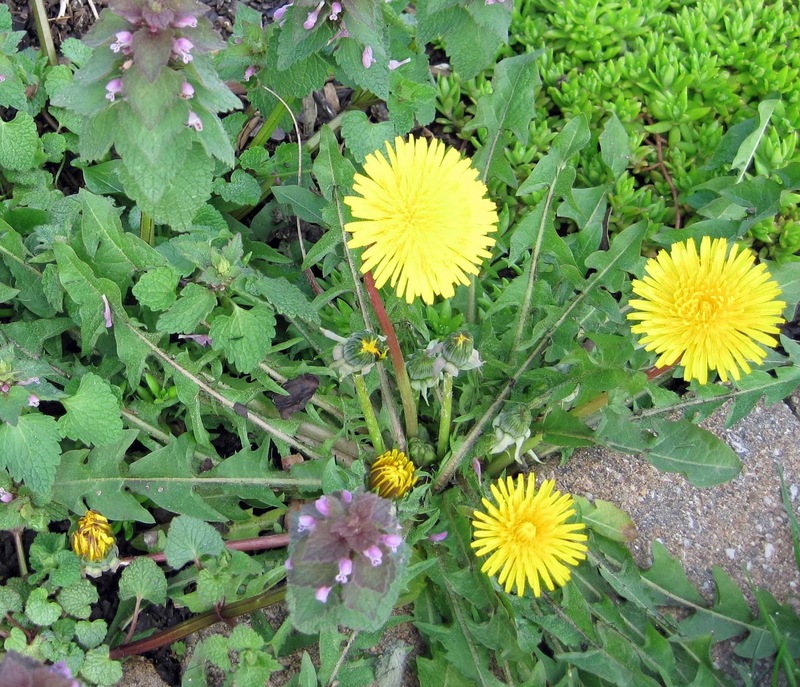 From Quackenbush, I know understand why that is not going to happen and why there is no shame in having some dandelions in your garden. In fact, I now look upon dandelions as evidence of garden fairy activity in the garden, if indeed I needed more evidence. "And that sturdy Dandelion which has escaped the diligent weeder! Do you realize it was born when ruthless men decided to banish the "little folk" from the earth? Most of us try to banish the blossom, too, but it someway persists in spite of ungentle treatment. When the dread decree went forth that fairy tales must go, the gnomes dug into the ground, the elves crept into crevices, and the brownies made themselves comfortable homes in the trunks of trees. But it was a tragic time for the fairies themselves, for they must have sunshine to live. So their queen had a happy thought and turned them into flowers, letting each take the color of the gown she happened to be wearing. It chanced that a number of tiny fairy kiddies in yellow pinafores were huddled together, and they were turned into Dandelions. Tenacious infants these, with the will to live strong in them, as many a weary gardener knows. Still, have they not a place in the scheme of things, if for no other reason than that mortal children love them?" Ah ha! I knew it! Those dandelion flowers are the clever disguise of garden fairies. Suddenly, a few dandelion flowers in the lawn and flower borders seems acceptable, the mark of a garden that welcomes the fairies and encourages them to put down a few roots, stay for the season and beyond, and enjoy the sunshine. Gardeners, lay down your dandelion diggers. This is not a battle we are going to win. Welcome, garden fairies, disguised as dandelions. Welcome. Evidently I have way more garden fairies than I realized. Sneaky, Carol! Gardeners are going to be stealing dandelion clocks to seed into their gardens now...you might have to fight to protect yours or they will be gone. Was this perhaps Ms Quackenbush's ulterior motive? Fairies or no fairies; dandelions are flowers, and their leaves can be used in salads, so that makes them pretty AND practical. And they're hardy and self-sustaining... Why don't we love them for themselves? One might as well accept them because they will be in the garden no matter what. I really like the idea that they are garden fairies. It gives them a little more credence. That explains why I loved them so as a child! Really, though, dandelions were probably a life saver back when, as they are so nutritious as well as plentiful. I taught my kids that dandelions leaves were edible. However, now I'm rather regretting that as we go to other people's houses and they rapturously exclaim, "Look at all those dandelions that they have in their yard!" I don't get all that many dandelions here but I will look at those I see quite differently! Dandelions are your best friend in the garden. Encourage them - don't fight them!